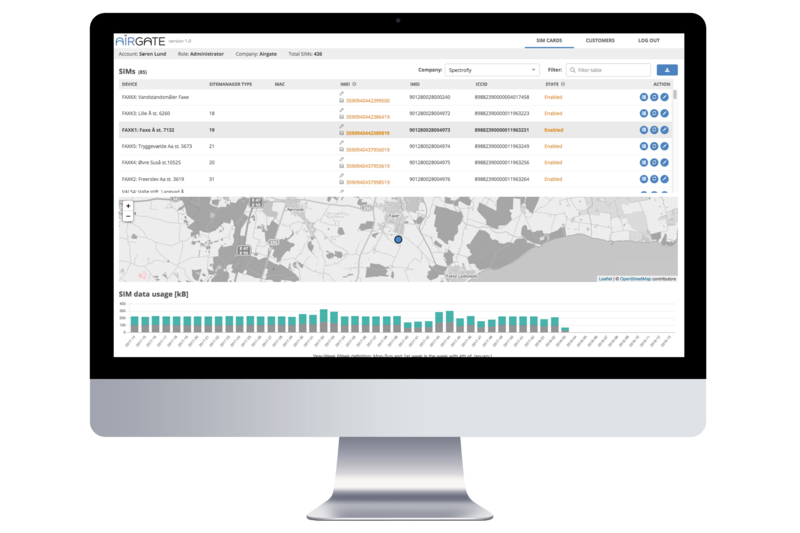 With myAIRGATE Connectivity Management Platform it’s easy to connect, manage and monitor your global IoT deployments. Our clouded platform offers full overview of your devices with real-time communication states, positioning, usage, alarms and diagnostics. The platform can be customized and branded to suit your specific business needs globally. As a virtual network connectivity operator in the field of 2G/3G/4G/LoRa/NB-IoT telecommunication AIRGATE provides you with global wireless connectivity and services together with our partner TDC, Vodafone and TELE2. Our connectivity offering is very flexible and comes with a lot of advanced services specific tailored for global industrial IoT requirements and needs. Test your IoT devices in the production phase before deployment. We offer free 100 kB test usage for 90 days before connectivity self-activates and all billing starts. To meet various kind of IoT device designs, we deliver standard plugin SIM, mini SIM, robust SIM, or solderable (SMD) SIM for GSM and NB-IoT and no SIM for LoRa. We offer connectivity with either public IP addresses, or private IP addresses. These solutions ensure your mission critical IoT data and works locally and globally. To protect your business from fraud/misuse we offer email alarms if IMEI/MAC/serial number of the device and the ICCID number of the connectivity no longer match. We offer scalable connectivity solutions for any industrial IoT projects and we adapt our solutions to meet your specific business needs and demand for functionality. Our connectivity solutions use multiple operators and networks in each country with only one price plan for +80 countries, which makes it easy to budget data usage. To ensure your connectivity against overuse or ‘Bill Shock’, we offer automatic usage control, and email alarms if your different thresholds for the connectivity are exceeded. Customised data packages for your specific IoT data needs, either per device, or for the whole device portfolio – both flat rate and consumption based data package pricing. With myAIRGATE IoT platform, our scalable and secure IoT management platform, is it possible to collect, analyze and visualize data from your industrial IoT devices. The IoT platform fulfill the Industry 4.0 needs and is a cloud based solution that addresses current constraints compared to the major IoT cloud solutions in terms of provisioning, security and adaptability. The IoT management platform comes with an easy to use front-end for presentation of raw data. Standard dashboards are easily customised and integrated on top. AIRGATE is a certified Universal Robots URCap software developer and has been for many years. We help industrial developers globally develop and integrate their end-effectors into Universal Robots. We support the development of Universal Robots as a strong sales channel for industrial developers of end-effectors, and make it easy for their end customers to use these end-effectors together with Universal Robots. AIRGATE has also developed the ARCS IoT communication solution, making it easy to get in touch with any Universal Robots. The ARCS solution is integrated and accessible from the teach pendant of the Universal Robots due to the URCap software. The communication gateway of the ARCS solution is hardware based and easily mountable in the controller box of the Universal Robots due to the specially developed bracket. We develop software to tie your IoT solution together end-2-end. It means that we create solutions in which we manage data communication between sensors and devices, and between devices and platforms to collect, process, and present your industrial connectivity and asset data in line with your existing and future business needs. We know how to integrate software across different platforms and how to ensure easy and secure deployments and usability of your IoT solution. We draw upon our telecom, IoT, software development, data science, cloud, design/UX and hardware integration competencies. 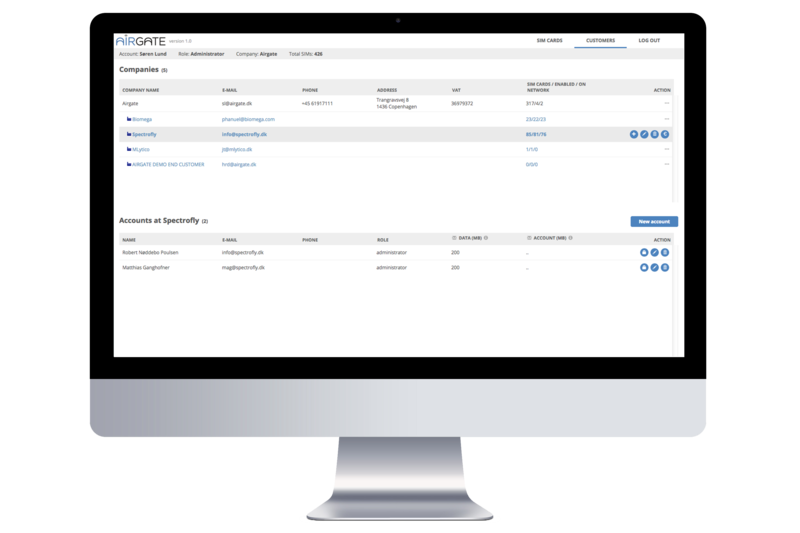 AIRGATE offers standard and customized PaaS for Connectivity Management and Device/Asset Management. We develop and integrate our clouded standard platforms to fit your specific use and business needs. AIRGATE offers IoT consultancy and commercial or technical workshops for scoping any IoT project. We design and deliver standard or customized IoT solutions regardless of the present stage of the IoT project. AIRGATE offers development of IoT SW to meet your solution needs. AIRGATE's IoT solutions are easily integrated into any existing business systems and operational processes with a rich library of standards-based API's. AIRGATE offers integration of IoT hardware and works closely together with selected and proven HW vendors of sensors and communication gateways, which all integrates easily with AIRGATE platforms. AIRGATE offers technical support service, able to help your company operating the IoT solutions. Hosting of standard or customized solutions, operation of services and other technical support services are available.